YOUR EARLY BIRD BRINED TURKEY WILL BE A HIT WITH YOUR GUESTS! Remember for Thanksgiving week, Go-Time for brining with Early Bird is Monday morning! The brine works a special kind of magic on turkey. And it really kicks in from 48 to 72 hours. That’s why we’re starting so early. Be sure to have your frozen turkey thawed by Sunday night. You can speed-thaw one on Sunday in your sink with cold running water. This will take 3-6 hours depending on size. Alternately, you could begin thawing a frozen bird on Thursday in your fridge and it should be thawed by Monday morning when you need it. A fresh bird works great, too. I’ve found, however, that it does not matter if the bird has a solution in it or is all-natural. With Early Bird I’ve had great results with both. 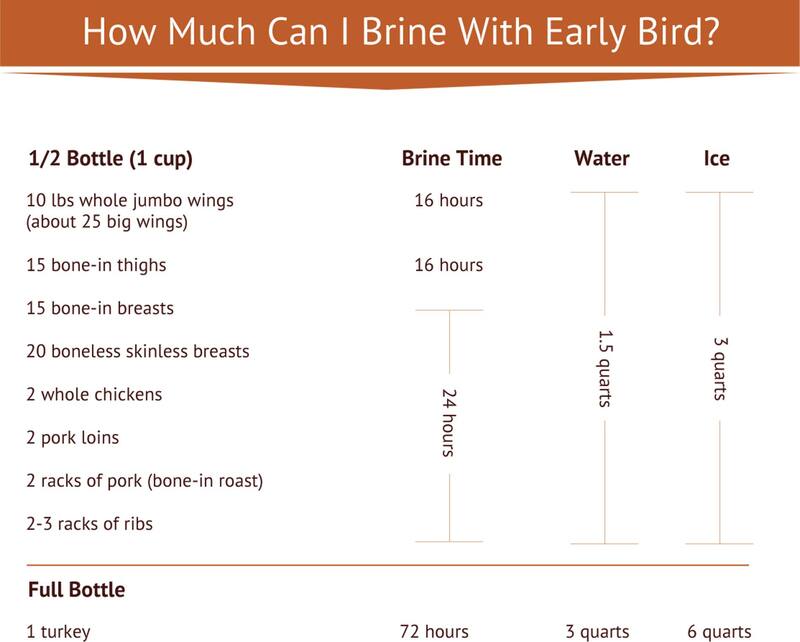 For a whole turkey, mix entire bottle of Early Bird into 3 qts boiling water. Whisk it for a minute to dissolve the sugar and salt. 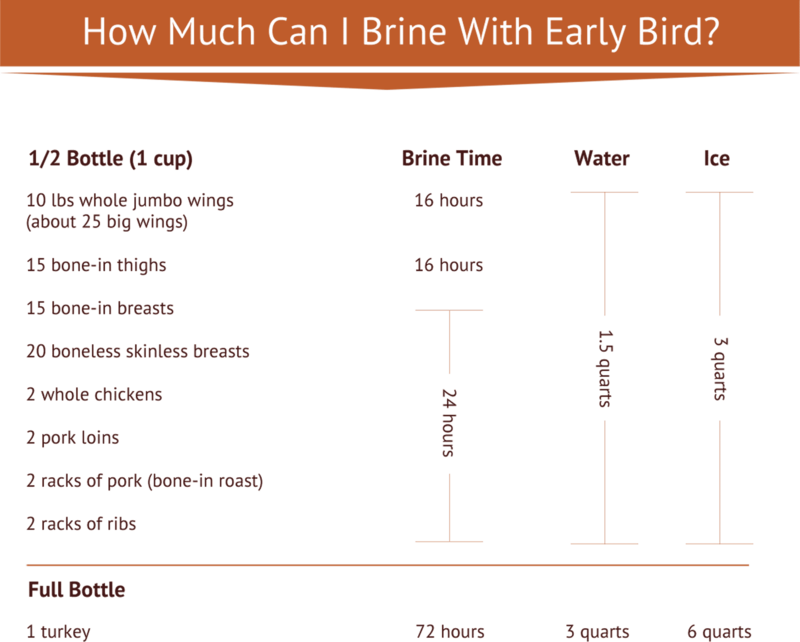 Ready your brine container with 6 qts ice.The melted ice is part of the solution ratio and will cool the brine down so the turkey can be added to it immediately. Remove your bird to a cutting board and spatchcock it by cutting along both sides of the back bone and completely removing it. Don’t be afraid to get tough with it but be extra careful your hands don’t slip if using a knife. You can also use a set of kitchen shears..
Press down on the breast and make sure the turkey is spread out flat. Ideally some bones will break when you do this. Slip your fingers between the skin and breast meat and create a big pocket on both breasts. Shake some Chicken Scratch into each pocket then rub it evenly over the breasts. Then season the bird completely. No need for oil since the bird is still a little damp from brining. Ready your smoker or grill for indirect cooking at 275° and use split pecan, apple or cherry wood on your offset smoker or 3-4 baseball size chunks on your grill. When your pit or grill is up to temp add the turkey to the grate (bones down). Depending on the size of your turkey, the cooking time will be 1.5 – 2.5 hrs. Check the temp in the thickest part of the breast starting at 1 hour so you know what’s going on. Then take up your turkey when an instant-read thermometer or leave-in probe shows 157° in the thickest part of the breast.